Dance News Paris, France is the central reporting site between Dance - Paris Night Life ( NightLife ), RMC and Dance 4 America, as well as other sittes for more detailed and in depth reporting. The Paris Dance Festival, Les Etés de la Danse, invites a different company to perform every year and in 2006 the privilege goes to the excellent Alvin Ailey American Dance Theater. All performances are staged outside the beautiful Hôtel de Rohan in the Marais. Programme 1 features the ballets Night Creature and Revelations. Programme 2 includes the ballets The River and Pas de Duke, while programme 3 brings together the company's highlights. The festival finishes with a tribute to Alvin Ailey. Please visit the festival website for full details of the programme. Salsabor Academy - Paris, France. National and International Social Dance Registry Created, August 28, 2005. Tri - Falcon and Dove Productions have launched its National and International Social Dance Registry, August 23, 2005. Initiated to assist dancers who are traveling to various destination cities, The reigistry is to first include those cities which are under The Inter - City Cultural Communications WebSite program. After which, it will be opend up to other cities which are not under this program. Rouen - Dijon - Le Havre - Orleans - Strasbourg - Lyon are all covered. Ithaca Editor Mr. Roger M. Christian requests " everyone who acknowledge the existance of weekly socials in cities - communities being service by this registry to contact him immediately. " 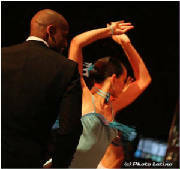 Weekly social dances are being accepted for France - French Social Dance Calendar. See [ WebPage ] and fill out the simple INTERNET from there.